They’re not have too much luck at Saga Cruises at the moment. Venerable flagship Saga Ruby, almost 12 months away from retirement, couldn’t make it back to Southampton at the weekend, and was held up in Portugal for emergency repairs. The ship was scheduled to go into dry-dock in Germany this week for a £4 million refurbishment, which will keep her in service until her farewell cruise next December. But a mysterious engine problem meant passengers were flown home from Porto on Friday. The ship remained there until Saturday afternoon when it set off at reduced speed for Bremerhaven. In the early hours of Monday morning, Ruby was rounding the north-east tip of Spain and about to enter the Bay of Biscay shadowed by cruise ship Thomson Dream, which is also sailing to Germany for a dry dock refit. 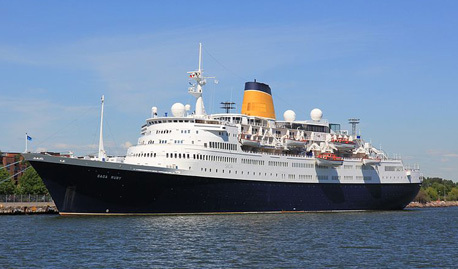 Aimee Spicer, Saga’s Social Media Manager, took over the Ruby’s Captain’s Blog to announce that the ship “has had some technical issues which will take a few days to repair, meaning we are unable to complete the planned itinerary. “We have therefore taken the difficult decision to offer all passengers the opportunity to leave the ship, and have flown a team from head office including our Chief Executive, Robin Shaw to personally oversee the return of all of those on board back to the UK over the weekend. “It goes without saying that everyone concerned will be receiving a full refund of their money and a sincere apology from all of us at head office. A further statement added: “A large proportion of customers chose to fly home, and a few opted to travel back to the UK by coach, which will be arriving Monday. Saga Ruby was due to go into refit at the end of this cruise and will obviously continue to do so. The problems with Ruby come just days after an accident investigation criticised the company’s safety standards after two crew members fell into the sea during a lifeboat drill on board sister ship Saga Sapphire. Saga Ruby is the last cruise ship built in Britain – originally the Vistafjord, launched at the Swan Hunter yard in 1973. She is due to set off on January 9 for her final world cruise, a 109-night voyage around South America and across the Pacific to New Zealand and Australia. The ship’s farewell voyage, a 31-night Christmas cruise to the Caribbean, will leave Southampton on December 7, 2013 – if they can keep her going until then. John, an interesting essay, but I have to say the “if they can keep her going” snipe at the end was pretty cheap. I’d like to see you keep your own wheelbarrow going for 40 years, let alone a true legend of the seas such that is Saga Ruby. Yours, Paul Smith. Are the crew will receive a bonus….